My name is Sean Boyce. 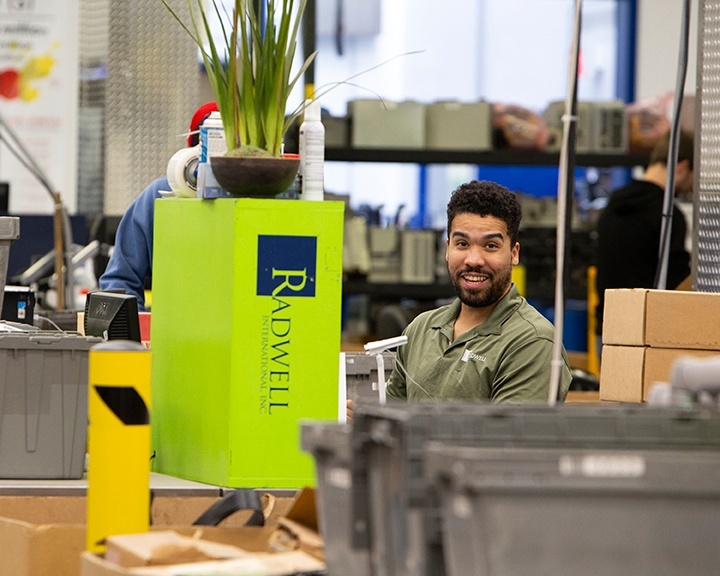 I work in Centralized Receiving here at Radwell International and I am a Centralized Receiving Support Team Member and a professional gentleman. I’ve been at Radwell International for 6 years. My favorite part of the day is when I initially come in. Every day when we come in here we’re always working on a different task, different parts, things are always changing. So we check our emails, we have our directions from management, and what I’m doing today is not you know it may not be what I did yesterday. Same thing with my counterparts, you know from my other team members and stuff since we’re all very close we’re all working on different stuff helping each other out. So what I’m doing maybe my partner might give me a hand and vice versa and then through that kind of production you can see how what we do really affects the company. That’s the part I like is seeing, you know, how the machine really works when it comes down to what I’m doing when I first come in the morning. What drives me to be the best at my job is how I take things in my personal life. In my personal life I have a very strong work ethic and that bleeds over into what I do here. When I come in here I don’t take shortcuts, I don’t waste my time, I don’t waste other people’s time, I know what I’m asked to do and I do it. Like I look at it like I want to, you know, grab the bull by the horns, lay the smack down, whatever you may have to do to get it done. Those jobs have to be finished, you have to, you know, you have to have a receipt for what you do and you don’t want to be the one who’s not counted on and to me it’s like I want to be an accountable person. I want to be a go-to person here and outside of here and that’s what makes me work hard when I come in here. What I like most about my job is the camaraderie that I have with my co-workers. We’re all fairly close, we tend to go to lunch together, we help each other out, we ask each other questions if we’re unsure we get a second opinion. People help you out if you’re frustrated or if you’re having an issue with a part you may not know about or something on the computer system. So knowing that you have people that support you and can help you out should you need it is key in a team environment such as we have here. So that’s really what I enjoy is knowing I can count on the people I work with. My job varies throughout the day. Typically the morning time is very busy and in the afternoon we tend to get a lot of shipments in at that time or expedited PO’s and stuff. So at any point I could be working on something and then I have a co-worker come and drop something off that’s been expedited and that person you know they want to get paid, they want their money so we have to, you know, that becomes you know what we have to do right then and there. So that typically happens in the afternoons or late mornings so that’s, other than that there’s a lot of variations throughout the day. The busiest part of the day for me is typically the mid-afternoon. That’s when we get a lot of shipments coming and going, UPS is coming in, all the other shipping departments and stuff like that. Also because of where I sit I can see the Breakdown department breaking stuff down that’s getting delivered and I know that something is coming here very soon after that happens so it’s usually around the later part of the afternoon during the close of business when things start to really pick up for the most part around here. And that’s a day in the life of a Centralized Receiving Support Team Member!